Although the idea behind sharing locations with your friends is not a new one, Bebo has taken this feature idea straight from the social media source (Facebook) and has tweaked it to match the Bebo app’s style and functionality. 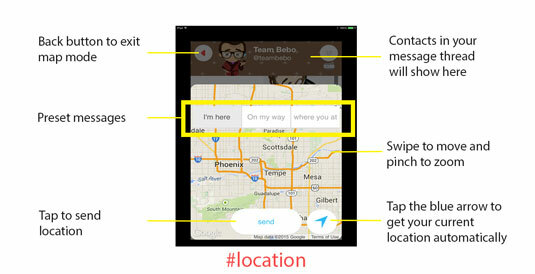 The following three easy steps will help you use Bebo location services for the first time. Also for those of you who are forgetful learners, it doesn’t hurt to brush up on a few Bebo tips and tricks every now and again! Open or create a message thread with one of your contacts. In order to share your location with your friends, you must first have an open message forum with one or more of them known as a “thread.” You can create a new thread by either tapping one of the friends in your contact list and then sending a message, or you can open an existing message and continue from an old thread already open on your app’s home screen. Threads can contain more than one contact at a time — Bebo actually encourages it! If you have no people in your friends list (hence no open message threads) then you can practice using location services with Team Bebo. You can also look for a friend by connecting your Facebook, Instagram, and Twitter accounts. Or if you know of someone on Bebo, and you know their username, you can open a thread with them from the search box by typing your first message followed by @username — replacing username with the username of the person you are trying to contact. Use #location to open the Bebo map. To use location services from within your message thread, type #location and tap Send. First a permissions message will pop up and ask if it is OK to use your current location; select Allow. A map then will populate in a pop-up style window showing your location as well as three message presets and a giant Send button at the bottom. You can send messages other than the preset messages provided by entering your message prior to using #location. For example, within the same message type Meet me here. #location, and the map will populate like before. Choose where you want the person to meet you and then press send. This time your map Beboji will include your message instead of being blank or including one of the three presets. It is that simple. Tap the message preset of your choice and then tap the send button. Typing #location by itself without using the message presets is possible and sometimes recommended. You can choose your location and tap send to post a map without a preset message on your thread. It is usually recommended you use the message presets so a friend knows why you are sending them the Beboji of a map; however, there are some instances where you just want to share you location and not send a message along with it. For example, you might want to send a Beboji of your location to brag about where you are to make your friends jealous (i.e., Hawaii). To navigate the map swipe up, down, left, and right to move your location, pinch to zoom in, spread (reverse pinch) to zoom out, and tap to select. You can also tap the arrow icon to have the application automatically find your current location for you. You can choose one of the three presets and then either let the app show your current location or choose a different location manually. After you select the message and location on the map, press the send button at the bottom of the screen. A Beboji of your location with your Bebo avatar along with your message will be sent to your selected contacts. Easy-peasy!